Last week I jetted to New Orleans for a journalism conference and then zoomed to Chicago for a blogger’s conference. After seeing these two groups back-to-back, I had a huge “A-Ha!” moment. I figured out why one group is beating the pants off the other. You see, there’s incredible pessimism in journalism circles: everyone’s crying about the lack of jobs. And there’s enormous optimism in the blogger community: everyone’s celebrating the zillion ways to launch a career ... Read the entire article. Before we dive into the personal lives of others, let me be clear about my intentions. I’m not here to embarrass anyone, find fault or make fun. My intention is to use examples from real life situations that will help some of this “soft technology” stick better, so we can improve our chances of success in personal financial matters based on insights from genuine experience. Read the entire article. How would you like to purchase your next vehicle without leaving your home? What if you could get the exact features you desire, the best interest rate available, and have dealers outbidding each other to get you the lowest possible price? What if unpleasant haggling and the disquieting feeling of getting rooked at car dealerships were a thing of the past? All this is possible by buying a car online. Our family just purchased a new van by using our computer. We didn't have to leave home until we went to test-drive and pick up our new wheels. Since we did all the research and negotiating first, it was a simple matter to sign papers and finalize the deal. Read the article. Frugal living does not have to involve drastic changes; a few simple everyday changes can go a long way. One of my least favorite things to do in life is deal with my car. Not because of the car itself. Because of the people I have to deal with when it comes to buying or repairing cars. Car salesmen and mechanics are two of the least trusted professions. I just have a hard time placing my full trust in them. It’s also possible that I have an unreasonable understanding of what it should cost to maintain a car past 100,000 miles. As an avid thrift shopper, I see firsthand the wreckage that bad laundry habits cause. The extra large virgin wool sweater that barely survives the dryer as size 3T, the nice white cotton shirt that met an early death from a red wine stain -- these are all preventable tragedies. Since we spend some serious cash on our clothes from time to time, let's make them last by exploring a few defensive measures we can take in the laundry room. Read the entire article. The U.S. Postal Service has proposed new 2012 shipping rates that are expected to start on January 22, 2012. The average increase for all shipping classes is 4.6%. Private carriers such as UPS and FedEx have already announced price increases for 2012. UPS announced they are increasing prices on ground and air shipments by an average of 4.9%. In September, FedEx announced it would increase rates by an average of 3.9%. The Postal Regulatory Commission (PRC) must review and approve the new rates before they become effective January 22, 2012. This is the same day the new USPS mailing service prices will take effect. Read the details. This introduction may run contrary to the title of this post, but I cannot overemphasize the importance of saving for retirement. If you are saving now, consider saving more. If you haven't started yet, you'd better get going. You can't start too early, and for the most part, you can't save too much. You may, however, be in a specific financial circumstance that justifies temporarily or permanently ceasing your retirement contributions. If you're in one of these four situations, then it may make sense to give your retirement account a break. 4 Reasons to Stop Saving for Retirement. Being an entrepreneur is hard enough work when you’re doing it by yourself. Having a team that you can rely on and use their strengths could help your business be successful. So why not start a family business? What a great way to keep the family close and earn extra money. You can decide to pursue the business full time or have it as a side business. Maybe your spouse can be your partner and the children can be employees. Get your in-laws together and maybe some siblings, and a family business is born. So what kind of businesses can you start with your family? Read more. I have not always been frugal. In fact, there are times now where I often feel less than frugal, as I occasionally make an impulse purchase or indulge in something that isn’t exactly frugal. But hey, I’m human. What I have noticed over the years is that our frugality has gone through very distinct phases, nearly coming full circle ... Read the entire article. No matter how much you have, everyone can use a little extra money. And that's truer these days than at any time in recent history. According to the Census Bureau, after inflation, median household income fell 2.3 percent last year and has dropped 7 percent since the turn of the century. With inflation-adjusted income falling, the average American has two choices: bring in more money, or watch your standard of living erode. On the other hand, there's no idea so crazy that there aren't some frugal folks out there who swear by it. (I hesitate to suggest an example, for fear of offending some of our committed readers.) Still, there is a line where frugality becomes pathology. In fact, there are two lines. We have names for them. We call them stingy and miserly. Read the entire article. Use the cartridges as they are to show off your sophisticated taste in ’80s music. Or if, like me, you prefer not to advertise how uncool you were as a teenager (Amy Grant’s Christmas album? Really? ), cover them with stickers and decals. If you’ve never known a world without CDs and iPods (or you jettisoned your cassettes long ago), don’t worry: The tapes are easy to find. Just ask around. Diving into your aunt’s trove might tell you a lot about her younger days and why she became a crazy cat lady. Read the entire how-to article. You've asked for it and we did it! We have finalized a new Grain Free Cat and Kitten Formula. Yes, it will be good for all life stages of your kitty! To go along with this new formula, you'll notice a new bag design. 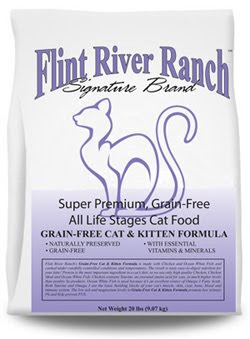 We feel that this cat represents the strength, vitality and good health that Flint River Ranch formulas provide. Attributes of our new Grain Free Cat and Kitten formula are higher portions of protein (42% minimum!) to other ingredients compared to our existing formula. Proteins make up half of the first 6 ingredients. Yes, this is still a chicken-based formula. Using chicken allows for easier transition from our existing cat food formulas. We are also adding a good amount of cranberry to assist in keeping your cats urinary tract in good shape and to help minimize urinary infections. There are a lot of other aspects to enhancing the cats litter box environment but we know that cranberries in their diet will help. Get more information on new formula. In a persistently bad economy where the mere absence of bad news is seen as good news, food shoppers can expect slightly less pressure on their pocketbooks next year. Smaller price hikes are expected for food overall, but watch out for meats. Read about it. The entire mission of World Swap Day is to raise awareness for swapping as the new shopping, by hosting (hopefully!) more than 500 events around the world during the month of January — clothing swaps, food swaps, book swaps, kids’ gear swaps, beauty swaps, video game swaps, seed swaps, teacher supply swaps, craft swaps, you name it — and have them all listed on our Events.Swap.com directory. Read more.